Enjoy Nashville and Old Hickory Lake in our spacious, comfortable home that is great for groups of 4-12, families preferred. Downtown is only 30-35 minutes away and easily accessible by car, Lyft or Uber. Watch the sunset from the covered patio, screened porch or private dock. Our beautiful 3 bedroom, 3.5 bath home will accommodate up to 12 people ($15 pp/night additional for additional guest over 10 people - see photos and descriptions for bed/futon/pull-out couch locations) and offers multiple amenities, including a private covered dock for fishing/boat/kayaks/paddleboards (bring your own), WiFI, a wet bar with fridge, large covered porch area with grill and dedicated kitchen (upstairs and downstairs kitchens), pool table, and HDTVs with BD players in every bedroom. Bedrooms have been recently updated with new linens, memory foam and/or Sleep Number beds and furniture has been updated throughout the home. Bring your boat (or rent from a local marina) and dock at your own private dock, where you can dive, swim or fish the day away! Enjoy the private, quiet setting which has some of the best sunset views on the lake or head into Nashville to see the sights. Experience everything Nashville has to offer with a 30-35 minute drive to downtown. You're also short driving distance from Opryland Hotel & the Grand Ole Opry, The Hermitage, and the Nashville Zoo. Enjoy the calm of the country and the excitement of downtown with this convenient location! We are originally from NY and moved to Nashville 4 years ago when my husband was transferred to the local office. I was a NYC high school principal in Brooklyn and have decided to switch gears here in Nashville to spend more time with my husband and our twin girls. I currently still work as an educational consultant for NYC schools, while also managing the rentals on this house. We have always loved to travel and we love meeting new people. So far the vast majority of our renters have been a pleasure to meet and accommodate. As you can tell from the pictures, this is a beautiful home that is perfect for entertaining, relaxing and enjoying the lake. We have stayed in other VRBOs where we paid a lot of money to rent the house, but then got there to find uncomfortable beds, furniture and a not-so-clean house. There is nothing worse than finally getting away only to be disappointed by your accommodations! With us, what you see is what you get; our photos are accurate and I have put a lot of effort into decorating the house and ensuring that the beds, linens and furniture are all up to date and comfortable. I know that you will not be disappointed! Our property offers the best of both worlds - enjoy the city at night, and relax at the lake during the day. The property features a deep-water dock and a swim ladder to enter and exit the lake. Rent a pontoon boat or bring your own kayaks. You won't believe that this little piece of paradise is so close to a major city. We love this location and know that you will too! toilet, tub, shower, jetted tub, Dual sinks; walk-in shower. Main floor master bath features a walk-in shower and can accommodate those with limited mobility. House is right on Old Hickory Lake. Access to private deep water covered dock and to the lake. Great views of the water and of the sunset. House is right on Old Hickory Lake. Access to private dock and to the lake. Great views of the water and of the sunset. Swim and fish off of the dock. House is right on Old Hickory Lake. Access to private dock and to the lake. Great views of the water and of the sunset. Natural gas automatic fireplace. Fireplace is turned off from April 15 to September 15. Spices, condiments and other items available. Adult and children's books. Leave one if you want to take one. Main floor (kitchen, living room, sunroom, dining area, pool table, and master suite) is accessible by wheelchair. Bathrooms are not wheelchair accessible on main floor. Perfect House and Excellent Hosts! A beautiful, clean, and well stocked home, plus the most accommodating hosts; we really couldn’t have asked for more! After a previous rental fell through 2 days before our arrival, we were scrambling to find a new place to stay near Nashville! Tom and Jeannie were so fantastic to work with at the last minute, and they even went ahead and purchased a pack n play for the house prior to our arrival which was a blessing so that we didn’t have to try to fit “one more thing” in the car :) We would absolutely stay here again if we return to Nashville! It is so difficult to put into words how well this home suited us on our spring break vacation (3/16-3/23/19). We drove from WI and had family visiting us from several locations in waves (IA, MI, FL and Germany), so total throughout the stay the home accommodated 12 people. The beds and bedding were all EXTREMELY comfortable, there were plenty of bathrooms and showers for people to use and there were enough kitchen supplies to serve at least one meal every day and varying in complexity...there was NOTHING that we couldn't find in the kitchen that was needed for our meal! We loved having the fireplace and outdoor area to hang out in. The neighborhood was GORGEOUS. I wished we would've rented a boat to use at the home but it was a bit chilly the week of our stay. Otherwise, the covered dock would've been super convenient!! The views from the home from every window facing the lake are beautiful, especially the kitchen and living room. The views alone did me in. The pool table kept the kids entertained, and we did crash in the main room and watched movies and basketball a couple of the nights. The sun room was PERFECT and my 9-year-old daughter did NOT want to leave the papasan chair in the far left corner! She snuggled up with one of their several throw blankets and knitted, read and talked to her friends. Last thing is the wildlife viewing from both inside and out. We saw a sandhill crane fishing off one of the docks as we sat on the edge of the water. It didn't notice us at all. We also saw woodpeckers and duck couples, and very low-flying turkey vultures showing off. There are also lots of deer that will come out and graze at night in neighboring homes. The neighborhood is beautiful to take a walk in, and safe. I even ran into the neighbor lady to the left who was very sweet. Great place to live and vacation in Mt. Juliet! It is about a 25-30 drive to downtown Nashville. Cheekwood and Belle Meade were about 45 minutes away. Nashville's roads wind quite a bit, otherwise it would be much faster as the actual distance in miles is not much. I absolutely loved our stay and would consider coming back to this home if we don't stay downtown based on the view and care and hospitality by the owners! Wow, Nadia! I am blown away by your review; thank you so much for writing such a thorough review and for your kind words. Tom and I try really hard to make sure that all of our guests have a really positive experience with us and it’s gratifying to read a review like this. It was wonderful meeting you and your family. Thanks for being awesome guests and for taking such great care of our house. I hope that you’ll come and see us again!! Our family had an amazing week at the Lake House. We didn’t want to leave! The house is perfect. It was very clean and well appointed. The location is fantastic and in close proximity to it all. Jeannie is wonderful and met us at the house to introduce herself and make sure we had everything we needed for our stay. Thank you for providing such gracious service and beautiful home for our vacation. We can’t wait to come back! Comfortable lake view home for large groups. Our group of 7 loved the well stocked kitchen for cooking, the sunroom for relaxing and the covered lower patio for enjoying the outdoors. The owners were very helpful and attentive in making our stay memorable. My husband and I had a wonderful short vacation at this beautiful house on Old Hickory lake. We really enjoyed the spacious yet comfortable atmosphere. I really loved the sun room for a great view of the lake. We couldn't believe there was pool table which was really fun. It was great to have a fully functioning kitchen with all the supplies that you needed to cook with. The den area was fabulous. Large comfortable sectional by the fireplace with access to the TV. It was great to be able to relax and watch movies. We liked to be able to look at the window and see the lake. We highly recommend this gorgeous house on the lake ! We are located directly on Old Hickory lake in Mt. Juliet (out near the Hermitage) and the house is very accessible to downtown Nashville. Rent a pontoon boat for a day on the lake or just relax under the covered porch and enjoy a swim off of the dock. 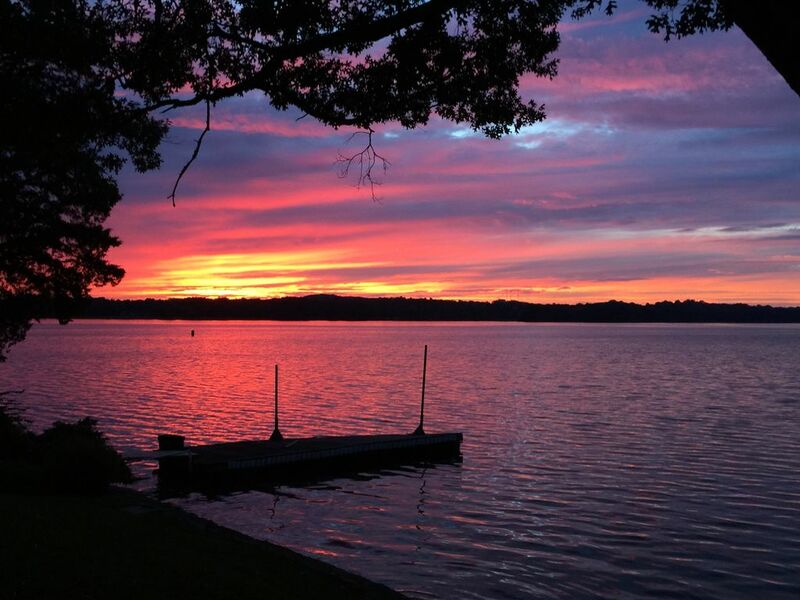 We are blessed with the best of both worlds - get a lake-side vacation home with lots of space AND get into downtown easily for great restaurants, bars and attractions. For almost the price of your average hotel room you can stay in a lakeside retreat! There is so much to do within driving distance! The primary renter must be at least 25 years age. We will make exceptions on a case by case basis with owner approval. Please review sample contract to ensure that you meet our requirements and can abide by our rules prior to making a booking.